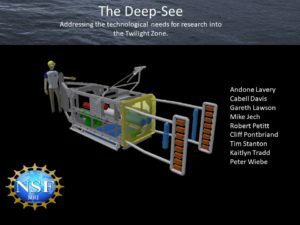 An NSF MRI funded project “MRI: Development of an integrated wide-band acoustical backscattering and large-area camera imaging instrument for studies of mesopelagic and bathypelagic ecosystems”. This project is developing a towed body equipped with a broad-band acoustic scattering system (5 kHz to 500 kHz), two camera imaging instrument systems (one a stereo camera pair, and the other based on holography), and integrated with environmental sensors that can address many of the sampling challenges in the mesopelagic and bathypelagic realms. 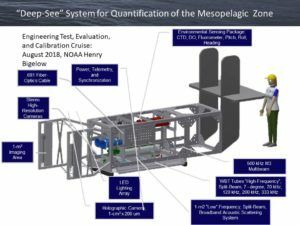 These acoustic and optic systems will be integrated into a dead-weight towbody rated to depths as great as 2,000 m and enabling high-band-width data telemetry and real-time control. The National Science Foundation MRI funded this instrument development. This is a joint project with the NOAA Northeast Fisheries Science Center.